Practice Ignition integrates with QuickBooks Online to automatically create and push invoices according to the billing information specified in your proposals. If you have items billed upfront, then as soon as the proposal is accepted by the client, Practice Ignition will create an invoice straight away. If you have services which are billed as a monthly recurring cost, Practice Ignition will trigger invoices on your designated monthly billing day each month for the period of the engagement. Note: We do not currently support the use of multiple accounting platforms at once. If you have integrated with one platform, you must switch off that integration before connecting to a different platform. If you sign up for a new Practice Ignition account through the Practice Ignition website, you will first be asked if you wish to connect to QuickBooks Online, Xero or Xero Practice Manager. You have the option of connecting now or later. Clicking the Connect button will take you to the log in screen for each app so you can connect the accounts. If you click to connect to QuickBooks, you will be prompted to log in to QuickBooks online if you aren't already logged in. Once logged in, you will be prompted to authorise the connection between Practice Ignition and QuickBooks. Simply click the Authorize button and it will connect. Click here to read more about configuring QuickBooks settings in Practice Ignition. If you did not connect to QuickBooks, Xero or Xero Practice Manager in your initial set up, you can always go back and connect later on. To do this, go to Apps on the left and click on the Connect to QuickBooks button to connect to QuickBooks. From here the process is the same as the above - you'll be prompted to log in to QuickBooks and Authorize the connection. We push information across to QuickBooks instantly whenever a proposal is accepted - both the client and invoice information are sent across. We also connect to the latest data in QuickBooks every hour for the data mapping, but you can sync manually at any time by clicking Sync below the QuickBooks toggle. 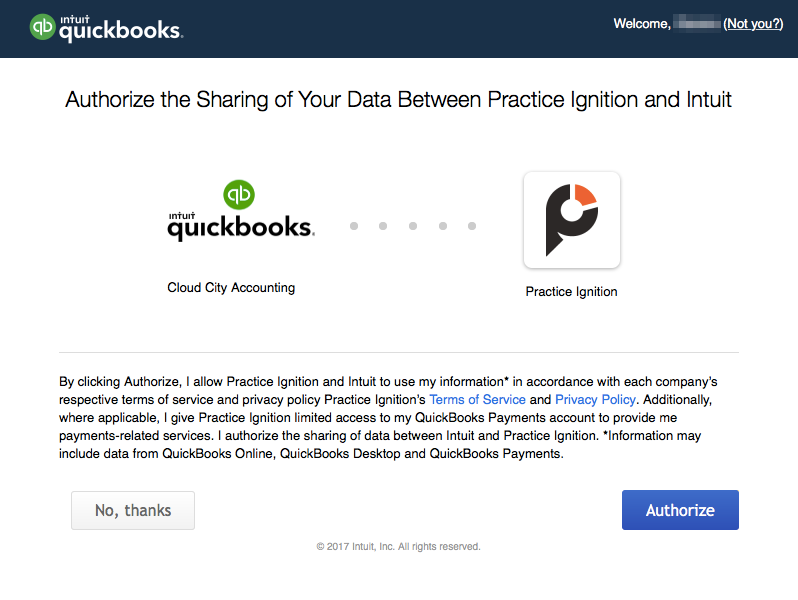 Note: Practice Ignition does not do a 2-way sync of client information to QuickBooks - it connects your Practice Ignition clients to QuickBooks clients through Mapping. If you need to connect to another organisation in QuickBooks, or your account becomes unlinked, simply click Re-link to go through the authorisation process again to link them.